I love the flowers and foliage of the Smoky Mountains, especially in spring. On our trip this April, however, I had to temper my desire to see and photograph the famous spring blooms in the Smokies. I had a choice. I could manage my expectations and adapt to the realities of my current post-stroke abilities or I could drive myself and husband Walter bloomin’ crazy. I chose the road less traveled, at least less traveled by me. I chose to be reasonable. Make that fairly reasonable. I had already had a little practice going down that road during a previous day’s stop in Dahlonega, GA. I posted about that experience here, but evidently I need a lot more practice to establish new attitudes. On a 2010 Easter-week trip to the Smokies, I was in a state of euphoria over all the different spring wildflowers that I had never seen up-close-and-personal before. I enjoyed them all over again when I posted about those flower species here. 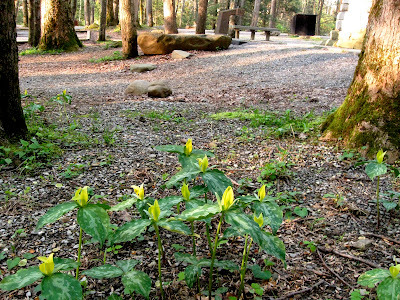 On our recent 2012 trip, time and terrain eliminated our taking the Cove Hardwood Nature Trail at Chimney’s picnic area, the Porter’s Creek Trail on the way from Gatlinburg to Cosby and other spring wildflower hotspots. But there were consolations. Loads of trilliums were ready to bloom. I ventured on a solo walk up a gravel path to take photos of a patch of yellow trilliums at Chimneys picnic area. When I arrived at my targeted destination, I realized I might take a Jack-and-Jill tumble down the hill I had just walked up if I tried to bend down low enough to get the close ups I wanted. Instead, camera clutched in right hand, I wrapped myself around a small tree immediately uphill from the plants and snapped. I am now literally a bona fide tree hugger. 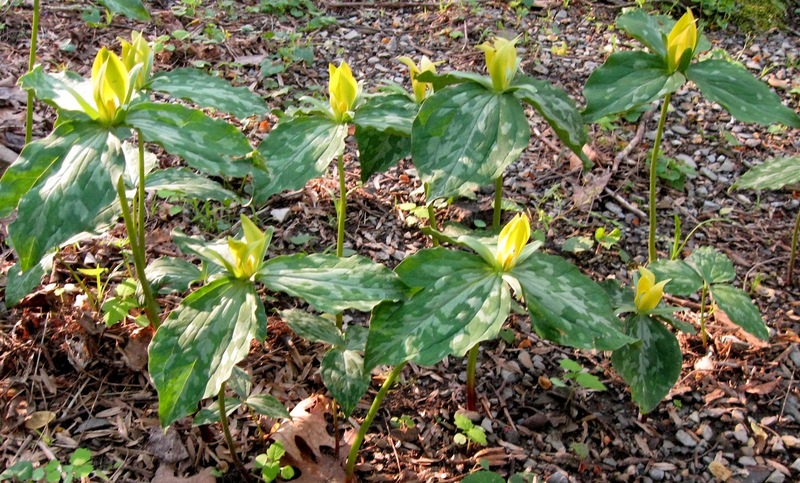 I never did see any of those yellow trilliums fully opened, in person or on any Web sites other than commercial sites advertising plants for sale. But they still provided a wildflower rush. The curled up yellow looked like a candle flame and I loved the geometry and coloring of the mottled leaf trios. 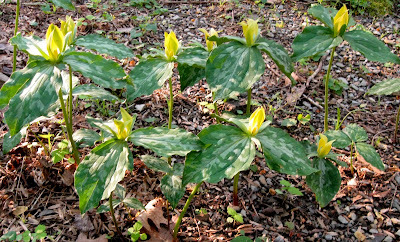 Mottled leaves grace yellow trilliums. 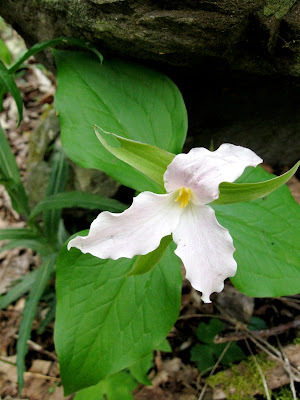 We saw abundant pink trilliums on the Roaring Fork Motor Nature Trail, a one-way drive that is just outside of Gatlinburg and is part of the Great Smoky Mountains National Park. The delicate pink barely showed up on the photo that I enlisted husband Walter to snap with my camera. 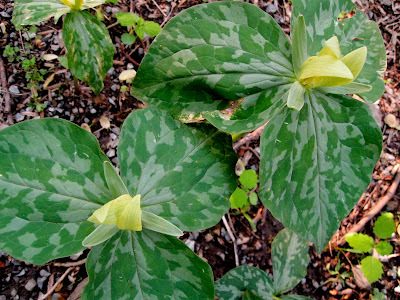 Unlike their yellow cousins, the pink trillium’s leaves were a uniform spring green, just as striking as the yellow’s mottled leaves. There were other patches of intriguing blossoms but rarely space to pull over for a closer look. We did see something else that delighted us, a young bear asleep high above the forest floor in the fork of a tree. He was too far away for our available camera lenses, but Walter did include our bear sighting in his post about the Roaring Fork Motor Nature Trail here. We had wanted to revisit this steep and winding wonderland for a number of years. This was our first springtime visit, and it did not disappoint. The added plus is that, even though my photo opportunities were scarce, I can visit Walter’s post whenever I want to. I can relive the drive and enjoy the historic buildings that he photographed while I relaxed safely in our comfy van. These are wonderful, I have never even seen a Trillium before, and I love those unusual patterned leaves, too. Hugging a tree can be a good thing!!! Please send Walter belated birthday wishes from me. It sounds like he had a nice birthday. You certainly have innovation and adaption down to a science. Well done. I have never seen Trilliums either in person. I love the candle flame reference. Perfect. It's interesting to see how you compensate for your disability. My daughter is going to grad school in June and in 3 years she will become a physical therapist. She should read your blog. I would love to see trilliums. They look so beautiful. PS I have been hugging trees for a long time. PPS You are inspiring me to try walking more. Love your adjustments and figuring out that being a tree hugger got you perfect pictures. I would love to see Trillium and that bear up in the tree. I so admire your determination and attitude! Your pics are wonderful! We had planned a trip there in April, but we had to cancel our reservations due to health problems, so I love seeing your pics and hearing about your trip. We always enjoy the Roaring Forks drive. I love going plant hunting, I wish trilliums grew in the wild here. I get to grow them only in the garden. Good for you, out and about and making the best of what you can do. That's the spirit! Hugging a tree whilst taking photos of beautiful flowers - wonderful life.